vCommerce: Let’s learn about virtual reality in commerce! Imagine sifting through a clothing rack of fine silk shirts. The fabric gently rustles as you push each garment aside. Once you’ve made your purchase, you head to the grocery store to get some produce. The peaches are in season so you add them to your cart and check out. Then, you place your virtual reality helmet on your bedroom night stand. You’re sitting in your robe, wearing your fuzzy slippers. This is virtual commerce, the future of online shopping. What Is Virtual Commerce, and Who Is Creating It? Virtual commerce, or vCommerce, is a service that helps companies transcend the physical barriers that brick and mortar companies face. It also serves as a middle ground between brick and mortar and eCommerce. vCommerce users can enjoy the convenience of eCommerce while interacting with brick and mortar components. Furthermore, vCommerce can reach global markets while using flexible payment systems and CRM databases. These tools allow it to engage in one-to-one marketing. Kantar Retail Virtual Reality is one of the creative companies working on vCommerce. They develop the use of virtual reality with retailers and consumer goods companies to help them understand in-store consumer behavior. Additionally, Kantar delivers virtual reality services to more than 20 markets across the globe. Virtual reality hardware is expensive. The cost of a new virtual reality headset can start at $600 and go way beyond $1,000. Even worse, consumers may need to pay for a high-end desktop computer if their current computer is not compatible. Many stores are reluctant to invest in virtual reality. eCommerce developed in 1971, and it took years for retailers to create effective eCommerce stores. 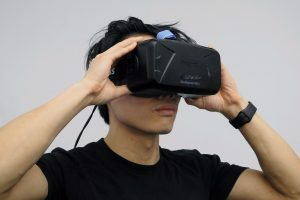 Retailers may be even more hesitant to invest in virtual reality if they are still perfecting their eCommerce systems. vCommerce cannot go mainstream without retail investment. People aren’t sure they really need it. PR firm Walker Sands conducted a Future of Retail survey for 2016. When they asked consumers if virtual reality would change their shopping decisions, almost 50% said no. While vCommerce may make shopping more captivating, the demand doesn’t seem great enough. So What Does the Future Hold for vCommerce? While many people remain skeptical, companies like Kantar are looking to implement vCommerce into our daily shopping experiences. They appointed Cédric Guyot CEO in May 2016. Guyot looks forward to building on the virtual reality foundation.